Overbury and Architecture PLB have transformed a central London library into a flexible and contemporary student hub. 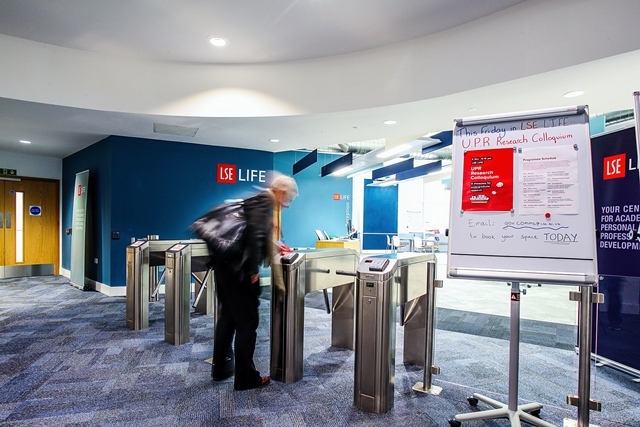 Overbury recently completed a £2.1 million project for the London School of Economics (LSE) on Portugal Street, creating a fit-for-purpose academic, personal and professional development centre known as LSE Life. 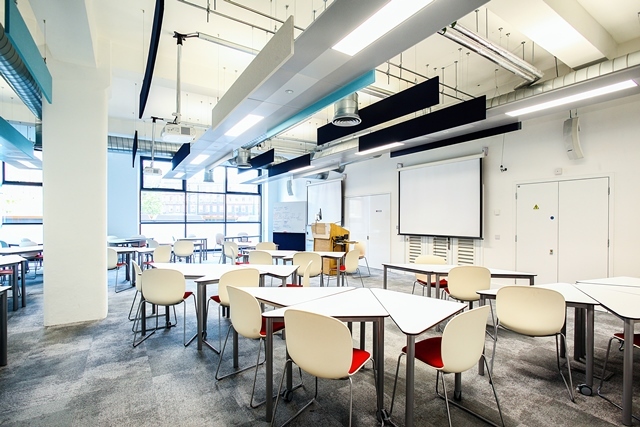 Transforming 20,000 sq ft into an entirely flexible space and “one stop shop” for students was a big task, says LSE Teaching and Learning Centre director Dr Neil Mclean. “The main objective of the project – the first of its kind – was to design and build a facility that would showcase LSE Life as a centre. We needed a central hub that would connect thousands of LSE students to our services. Our students come from all over, and many are new to London altogether, so it's important that they know enough about us to be able to take advantage of the opportunities we offer,” he continues. "Not only did our students need a place to go, they needed to know that we were committed to their professional and personal development. This space represents everything we do and, importantly, it was designed with them in mind." Architecture PLB was tasked with developing a design that provided a mix of social, quiet and collaborative areas, which reflect new ways of learning and approaches to education, while Overbury was contracted to bring these plans to life around the busy schedules of LSE staff and students. Another challenge was moving two one-tonne air handling units into the basement. These were inched down the helical staircase using timber blocks and steel plates, turning the distinctive Norman Foster-designed stairwell into a ramp. Ducts also needed to be installed to carry air to the upper floors, which meant that the team had to drill through a solid metre of concrete. To do this discreetly, a special ‘non-percussion’ diamond rig drill was used to reduce noise and vibrations. After months of planning, designing and construction, LSE Life opened its doors in late September and has received positive feedback. Its first big event was a careers fair that hosted over 900 students and since then it has been used for numerous seminars, workshops and lectures. 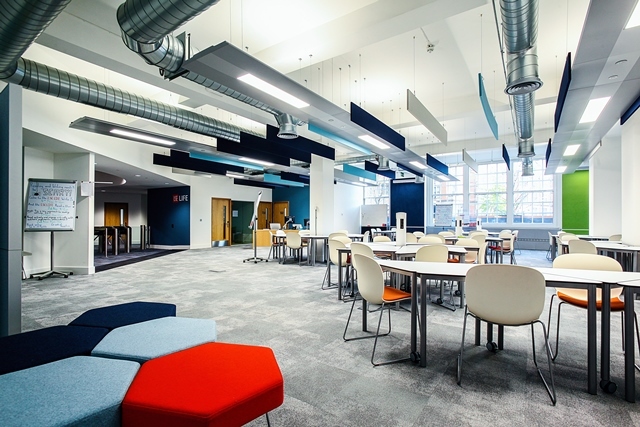 Everything from individual study to a 200-seated lecture can be accommodated in the space. The focus on flexibility and multi-functionality means that the centre, and its intricate tessellating furniture, can be configured to support the needs of students. The Wi-Fi enabled building now also has upgraded mechanical and electrical infrastructure with new ‘power towers’ and AV facilities. LSE Life is housed in the 100-year-old Lionel Robbins Library on Portugal Street, London. The project team included Overbury; Architecture PLB; mechanical and electrical consultancy, CBG; and project management and quantity surveying firm, Mortimer Isaacs. Heather Evans from Rider Levett Bucknall was the SKA assessor appointed to the project by LSE. This project is Overbury’s sixth fit out for LSE in two years. The number of years that more than 31% of our staff have been with us. A Morgan Sindall Group company. © Overbury 2019. All rights reserved.